We pass a McDonald’s on the way to and from school. Each March the kids notice the Shamrock Shake sign up and ask if we can stop. 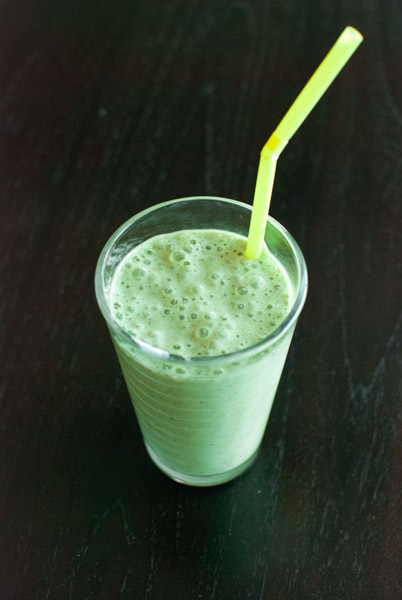 I say, “Let’s make our own and add chocolate chips!” We make mint chocolate chip smoothies all the time but somehow making them green is more special, so I added some fresh baby spinach. You can’t taste the spinach and you get to add a veggie. Drop the following into a blender, mix well, and enjoy! 1/2 c. milk of your choice. You may need to add a bit more. Yummy! Thanks for sharing, my girls are always asking for those shakes too, can’t wait to give your recipe a try at our house this week! Found you through Pink and Green Mama’s linky party. What a great recipe! Thanks! This entry was posted on March 4, 2015 by mdaucello in Recipes, St. Patrick's Day and tagged leprechaun, mint, recipe, shake, smoothie, St. Patrick's Day.